Intellectually, we know how important the Nile River is to Egypt. It can be seen on a map; the blue line that waters a country. But the Nile’s importance is really hammered home when you leave your mooring place on the river and travel a few miles east or west. What appears to be a fertile, well-watered country, when in sight of the Nile, quickly turns to inhospitable desert. Egypt would be as dry as the Arabian Peninsula without the Nile. It would be as parched as Libya or the Sinai, without the Nile. Visitors to Egypt fairly quickly figure this out: To cross from the green patches of land that hug the river to the interior … well, it is jarring, which we saw up close the other day when we bused to the Valley of the Kings, just outside the city of Luxor. Practically everything that has value in Egypt is next to the Nile or within spitting distance of it. 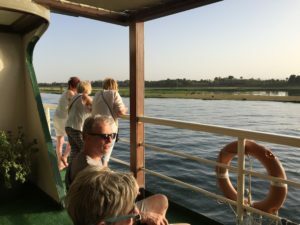 We are taking a Nile cruise, and to go from our ship’s berth to the Valley of Kings, which can’t be more than five miles away, is like traveling from Eden to a moonscape. Egyptians do not appear to have much individual wealth, but collectively they generally get along fine if they can get Nile River water to their crops; if not, there is trouble. If a person never left his ship, he would have trouble believing that 90 percent of the Egypt is lifeless waste. The country goes almost directly from the Nile (and its delta, on the Mediterranean) … to the Sahara Desert. It is interesting to consider, when rolling on the river at a stately 20 miles per hour (thereabouts), to look out the porthole in your cabin and see a hundred yards of river, with crops and animals thriving on the shore. The Nile usually is considered the longest river in the world (ahead of the Amazon, the Yangtze and Mississippi), at more than 4,000 miles. It has to be one of the most significant, too, in terms of what it means to the 12 African countries watered by the Nile or its tributaries. The Nile also serves as the country’s major highway. Sizable boats and tourist ships course up and down the river, which is handy, because nearly all of Egypt’s great historical landmarks (like the Kom-Ombo Temple, which we saw today) are mere miles from the river. Sail far enough up the Nile, and eventually it narrows and becomes less imposing and not fit for the big tourist boats. But in Egypt, the Nile continues as one big, wet kiss to the whole of a country.